From the original Broadway production of Grand Hotel, L-R: Henry Hull, William Nunn, Eugenie Leontovich, Lester Alden, and Rafaela Ottiano (1930). Rafaela Ottiano (4 March 1888 – 18 August 1942) was an Italian-born American stage and film actress. Born in Venice, Italy, she emigrated with her parents to the United States, and was processed at Ellis Island in 1910. Ottiano established herself as a stage actress in Europe before arriving in Hollywood in 1924 and appearing in American motion pictures. She appeared on Broadway in Sweeney Todd (1924), the Mae West play Diamond Lil (1928), and the play version of Grand Hotel (1930). Ottiano's first film was in the John L. McCutcheon-directed drama The Law and the Lady (1924) with Len Leo, Alice Lake, and Tyrone Power, Sr.
Ottiano was part of the original 1928 Broadway cast of the hit play Diamond Lil, written by and starring Mae West. 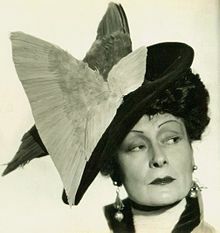 Ottiano reprised her role as Rita when the play was adapted for the movie She Done Him Wrong (1933), directed by Lowell Sherman. Throughout the 1930s, Ottiano would often specialize in roles as sinister, maleveolent, or spiteful women, such as her role in the Tod Browning-directed horror film The Devil-Doll (1936), opposite Lionel Barrymore and Maureen O'Sullivan. Other notable film roles for Ottiano include Lena in As You Desire Me (1932) with Greta Garbo, Melvyn Douglas, Erich von Stroheim, Owen Moore, and Hedda Hopper, "Mrs. Higgins" in the Shirley Temple musical-comedy Curly Top (1935), as a matron in the crime-drama Riffraff (1936), starring Jean Harlow and Spencer Tracy, and as "Suzette", Greta Garbo's devoted maid in the Edmund Goulding-directed drama Grand Hotel (1932). When Grand Hotel was turned into a Broadway Musical in 1989, her character was renamed Rafaela Ottiano in honor of the actress, who had appeared on Broadway in 1930, in the original play version of the Vicki Baum novel. Ottiano's last film was the musical comedy I Married an Angel (1942), starring Nelson Eddy and Jeanette MacDonald. During her career in film, she appeared in approximately 45 motion pictures, opposite such actors as Barbara Stanwyck, Conrad Nagel, Peter Lorre, Zasu Pitts, and Katharine Hepburn. Ottiano lived in the Times Square area during the Prohibition Era and never married. She died in 1942, in the Boston home of her late parents, of intestinal cancer at the age of 54. She is buried at St. Michael's Cemetery in the Roslindale section of Boston, Massachusetts. Wikimedia Commons has media related to Rafaela Ottiano. This page was last edited on 18 November 2018, at 01:38 (UTC).